Based on the Deeds of 194 Stoke Lane. Also on various OS maps & a replica Tithe map of 1841. Compiled and extracted by James Briggs, owner since 1965, only the third since the house was built in 1929. 2nd Sept 1824. The Will of George Smith of Crossway Green in the parish of St Arvan's in Monmouthshire left in equal portions to his four children (George Shuter; John Capel; Thos Wade snr. and Jane Hutton snr.). "all that his freehold messe lands & premises called Cote Farm, then in occupation of Sir Henry Prothers." He died some time later - date not recorded. 12th Oct 1842. George Shuter Smith died and left his quarter of the estate to his siblings John Capel, Thos Wade snr. and Jane Hutton (now Mrs Stephens) and, on their deaths, equally to the 7 children of Thos Wade snr. - Elizabeth Capel, Sarah, George, Jane Hutton jnr., Laura Anna, Thos Wade jnr. & Octavia Gainey. NB Family names seem to have been repeated from earlier generations. (At this stage TW snr. had 1/4 plus 1/3rd of one 1/4 = 1/3rd of the estate). 31st march 1846 Jane Hutton snr. died. She was a widow with no children. Her will could not be executed and so her share went to her bother John Capel as legal next of kin. He now had 2/3rds of the estate. 17th Sept 1856 John Capel died and left his share to his brother Thos Wade snr., a Surgeon, who now had all the estate. The land was then in the occupation of Joseph Tucker as a yearly tenant. 24th March 1857 Thos Wade snr. died. On his death his 7 children each inherited 1/7th of the original 1/4 belonging to George Shuter Smith (see 12th Oct 1842 above), ie each had 1/28th. The rest of the estate he left to his wife Sarah, ie 3/4s of the whole. 30th May 1878. Sarah died and left her 3/4s equally to her sons George and Thos Wade jnr. They therefore had 3/8ths each, plus their original 1/28th, ie 11.5/28ths. 4th June 1886. Jane Hutton Smith jnr. died and left her 1/28th to her brother George, ie he now had 12.5/28ths of the estate. 22nd August 1886. George, a Surgeon of Coombe, Westbury-on-Trym and then residing at 1 Digby Villas, Avenue Road, Bournemouth, died and left his share in trust with the income to go to his wife, until she died and the land then to his bother Rev Thos Wade jnr. who was then living Easton Royal, Wilts. The wife, Beata Maria Counsel, died on 5th Nov 1900 and was buried in Weston-super-Mare. TW jnr. then had his 11.5/28ths plus the 12.5/28ths above, ie 24/28ths. 1st Oct 1887. Laura Anna, now married to Dr James Riley Greenway, physician of Eton Lodge, Tunbridge Wells, Kent, sold her 1/28th to her brother Thos Wade jnr. for the sum of £223 to make up his holding to 25/28ths. 19th June 1895. Elizabeth Capel Hitchen (neé Smith) of 81 Oxford St, Reading, Widow, sold her 1/28th to her brother, Rev Thos Wade jnr. for £100. At this stage my deeds say that her piece of the estate was known as "Cross Elms Field". It was used as pasture by the occupier T Hooper. TW's holding then rose to 26/28ths. 30th Nov 1896. Octavia Gainey sold her 1/28th to her brother Thos Wade jnr. for £355, thus giving him 27/28ths. 3rd March 1898. Sarah Rickman (neé Smith) died and said in her will that her 1/28th should be sold privately, or by auction, "for the best price that could be gotten". 14th May 1900. Sarah Rickman's 1/28th was sold to her brother Thos Wade jnr. for £400, making his share 28/28ths of the original estate, and thus returning the estate to the original size of about 103 acres. 1st Sept 1925. Thos Wade jnr. died and left his Estate to his two sons. 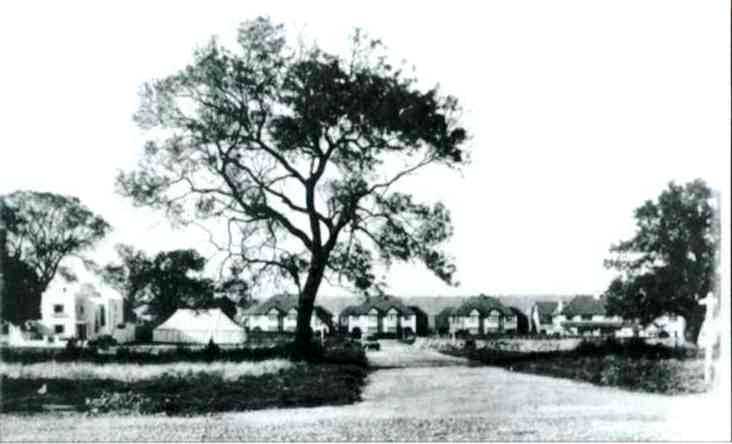 The land was known as Cote Grange Farm and was in the occupation of EA Green. 22nd Mar 1929. Part of the land was sold by the two sons to Austin Voke, Builder, of 36 Florence Park, Westbury Park for the sum of £1470. 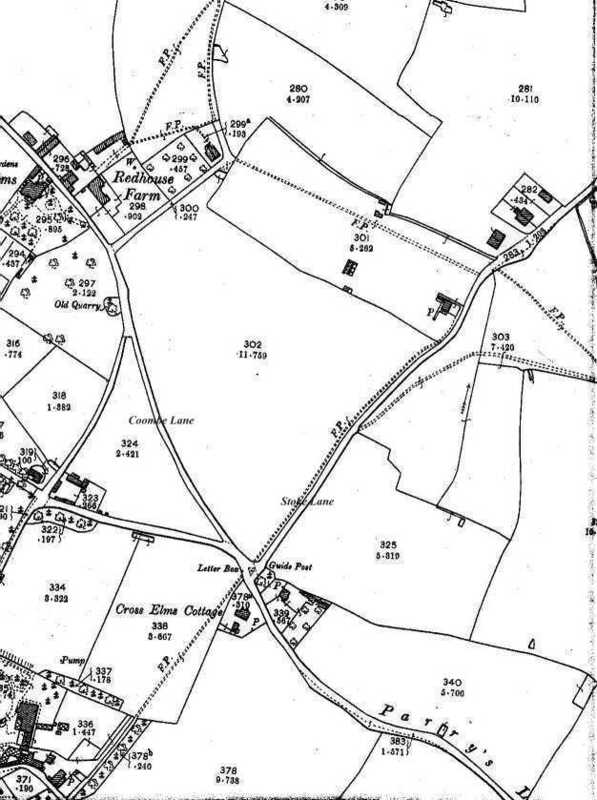 This portion was 1.47 acres and formed part of Cote Grange Farm having a frontage to Stoke Lane of approx 400ft to a depth of 171ft 8ins (a plan attached to my deeds shows the frontage marked as 391ft 6ins). On this land Austin Voke eventually built 19 houses, now being 212-176 Stoke Lane. The houses were not to have a value of less than £1000. Austin Voke also had to agree to erect a substantial fence on the north side of the land similar to that on the south side and to remove a gate at point A on the plan to point B on the plan to give access to a proposed 10ft right of way along the side of 176 - see plan below. 9th May 1930. A house and land of plot No 10 of Austin Voke’s 1.47 acres was conveyed to Mrs Helen Maria Burn, widow, of 24 Hanbury Rd, Clifton. The house became "Braeside, 194 Stoke Lane", then described as being in Stoke Bishop in the conveyance documents. The price was £1450 with an annual ground rent of £10/10/- (£10.50), payable in twice yearly portions on 24th June and 21st December. Stamp Duty was £17. The purchaser, among other things, guaranteed to keep "all boundary walls and drains belonging thereto in good and tenable repair and condition". The precise nature of these boundary walls was not specified and was presumably not specified in the other houses. Hence boundary walls became the responsibility of the properties on each side. Mrs Burn seems to have lived in 194 with her unmarried daughter, Helen Laverton Burn. (In January 2011 I had an email from Ian Varndell. He wrote the following about Mrs Burn. 'My wife and I moved into our new home in Bovey Tracey, Devon, last September and have been researching its history. The house is Edwardian, and the second daughter of the first owners (Charles and Helen Maria Burn) was named 'Helen Laverton Burn'. Whilst searching her unusual name on Google I came across your web article entitled, "Lands in Part of Stoke Lane, Westbury-on-Trym". I was fascinated to note that 194 Stoke Lane was originally named "Braeside" - the same name recorded for our house in the 1906 Kelly Directory for Devonshire and on several of the early conveyance documents relating to this property. Our house was renamed "Brimley Cross" in 1930. 6th July 1943. Mrs Burn died in Lyncourt Nursing Home, Middle Lyncombe Drive, Torquay. Her daughter continued to live in 194. 3rd November 1960. The daughter, Helen Laverton, died. 11th January 1961. The property was conveyed to William Albert Sims, bank clerk, for the sum of £4900, plus annual ground rent, still £10/10/-, this sum being fixed in perpetuity. At this stage the property was described as being in Westbury-on-Trym. 28th January 1966. The property was conveyed to James Charles Briggs of 11, Chesley Gdns, East Ham, London E6, newly appointed Consultant Pathologist to Frenchay Hospital, for the sum of £7275, for which he took out a mortgage for £6000 and paid the rest from the proceeds of the sale of his house in East Ham (this house had been his parents’ house; they sold it to him when they moved to Eastwood, Southend-on-Sea in 1962). Ground rent still £10/10/-. 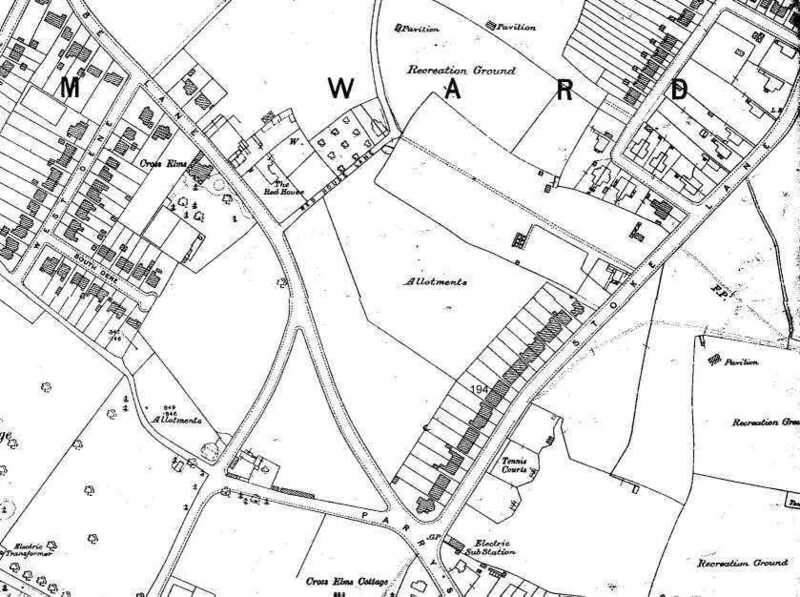 NB Cote Farm, as indicated on the 1870 map below, was situated from Stoke Lane up the hillside to reach Westbury Rd. This is the only reference that I can find to the farm as an entity. No local details are shown on OS maps until the 1882 editions, and these only give the field numbers (and acreage in 1903), but not ownership. The 1841 Tithe map gives names, but not sizes, to the fields, and does not indicate to which farms they belonged. My deeds describe the 103 acres as "Cote Grange Farm with several pieces of pasture land thereto belonging." The Farm can thus be seen as having a main acreage with several outlying fields. It was part of one of these (French Grass Ground according to the 1841 Tithe map and measuring 11.759 acres on the 1903 map) that was sold to Austin Voke in 1929. 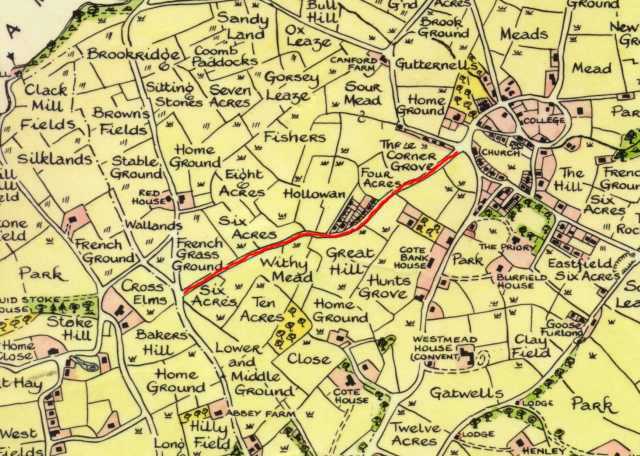 The 1882 OS map shows "Cote Grange" at the end of the lane running off the Downs past Badminton School (then known as "Northcote") and St Monica's, then known as "Cote House". "Cote Grange" may have been the farmhouse. "My family changed their name from Webb to Peploe around 1866 but an early ancestor, Captain John Webb, purchased Cote House on Durdham Downs in 1775 and was probably responsible for the 'delightful Gothick exterior' which had inspired Turner to paint a watercolour of the place in 1791. Cote House was sold by Captain John Webb's widow in 1797 but I am pretty sure Captain Webb's two children, Colonel Edward Webb M.P. for Gloucester and Frances Webb, retained Cote Farm. Certainly Colonel Edward is always referred to as of Stoke Bishop and in his will (1811) he mentions his sister as living at Cote Farm. Around 1820 Frances was left the estate of Adwell in Oxfordshire and she and her brother moved there, as he was by now a widower."). "Cross Elms Field", which was sold for £100 in June 1895 by Elizabeth Capel to her Brother Thos Wade jnr. (see above), seems to have arisen from a division of a larger plot called "Cross Elms" (now The Grove) on the 1841 Tithe map. The 1882 and 1903 OS maps show this area divided in two, one about 3.4 acres and the other about 3.7, both thereby approximating to 1/28th of the original 103 acres. The area is further defined in my deeds as "Ord Survey 302". However, the plot which became "Ord Survey 302" on the OS maps, was "French Grass Ground" on the Tithe map and not "Cross Elms". "Cross Elms" - the whole undivided plot of the 1840s - became plots 334 and 338 on the OS maps. I can't explain this anomaly and none of these OS maps give field names to help. I guess that labourers from the several local farms lived in the circa 1820 cottages, near the present pubs. The older house on the corner of Stoke Lane and Stoke Grove (168 Stoke Lane) was built in the late 19th century and is present on the 1903 OS map, as are 160-152 (166-162 were built in the 1930s). Abbey Road was built after 1903 between 158 and 156 and more houses were built from 152 to reach Charlcombe Rd. (The present shops were built in the 1960s on land previously used for two of these later houses). Further development, also seen on the 1903 map and including the older shops, went onward from Charlcombe Rd. 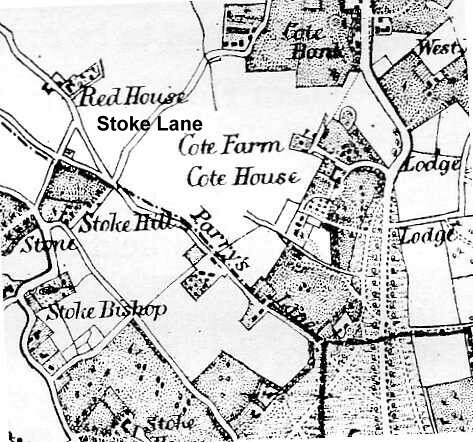 to reach Back Stoke Lane and Stoke Lane with their 1820 cottages (all shown on the 1841 Tithe map). Other maps show that the Black Swan was there in 1882 but that the Prince of Wales is more recent and not seen in 1903, 1916 or 1936). More 1930s building then extended to Falcondale Rd., itself built in the 1930s (shown as planned on the 1931 update of the 1916 OS map). 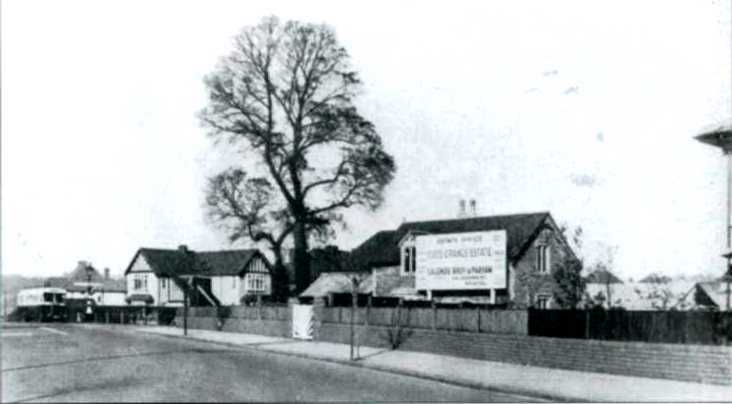 Abbey Road is present in 1931, but Stoke Grove comes later, with a Nursery at the back of 168 Stoke Lane. By 1936 some houses, not seen in 1931, appear opposite the Voke's houses in Stoke Lane, with an electricity sub station and tennis courts near Parry's Lane. Various other local roads were partly laid out, including Cote Park and the Witheys. Barley Croft and Parry's Close were planned. Other nearby land belonged to Canford Farm, and was sold off from time to time. For instance Canford Cemetery, which was opened in about 1904, occupies part, as does Canford Park - neither seen in 1903; the University Sports Fields occupy some more and all are shown on the 1916 OS map. 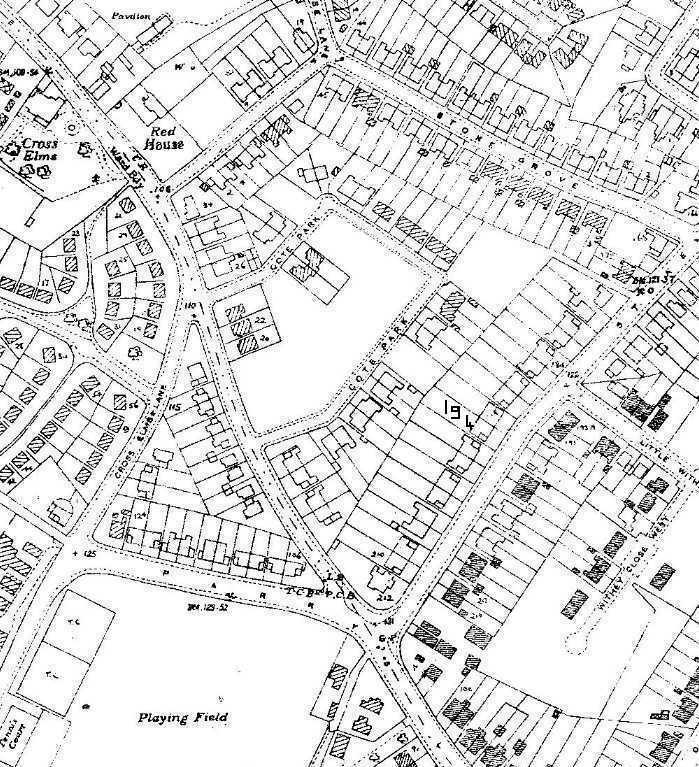 The 1949 OS map shows that the Cemetery was extended by that time, to the right of the current back entrance, by use of a field which reached the bowling green in the park and which was labelled "Recreation Field" earlier. Not all the field was given over to the cemetery - part was used for allotments. 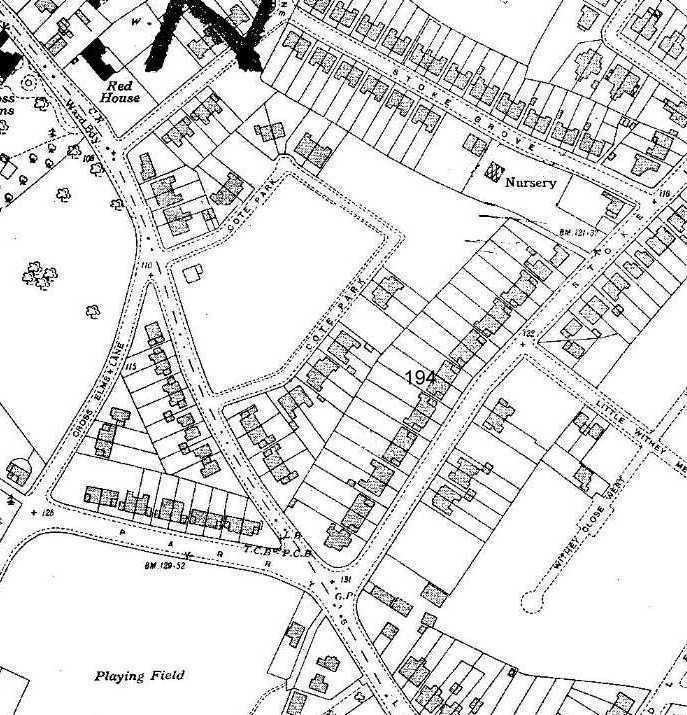 A map attached my deeds also shows that the land now occupied by Cote Park was "Corporation Allotments" in 1929. Stoke Lane was also affected by the Bristol Blitz between late November 1940 and mid April 1941. In 2009 I was told by a neighbour in number 209 that a previous occupant of 211, Rachel Ufton who was aged 13 at the time, told her that "on one dark November winter's night a 50lb high explosive bomb exploded in the road outside number 209. It blew off the gates which flew over the houses on the opposite side of the road, over their back gardens and into the gardens in Cote Park". The bomb also hit a gas main; the gas caught fire and produced something like a volcano eruption! Rachel also said that, in 1941, a 'land mine' landed in Reedley, behind her house. At least one person was killed and many houses damaged, including Rachel's. She and her family, along with other families, had to be evacuated. Rachel was still alive in 2010 and I managed to speak to her in March. She said that the bomb had landed in the front garden of 209 and partly tunnelled under the house foundations; the gas explosion occurred a few minutes later. Another stick of five bombs was dropped soon after, possibly by the same plane. One bomb fell on the bus stop in Parry's Lane near the junction with Stoke Lane (about where the bus stop was still situated in 2010); the other four fell on what Rachel described as 'waste land' at the back of her house on what was to turn into Withey Close West. The 'land mine' was dropped on Good Friday 1941 and hit two houses in Reedley Road, totally destroying them and damaging many nearby houses, including Rachel's. NB. A WW2 'land mine' was a bomb with a delayed fuse which did not explode on impact. They were often dropped by parachute. Some parachute bombs were said to have had hanging detonators which, when the detonator hit the ground, would cause the bomb to explode in the air. 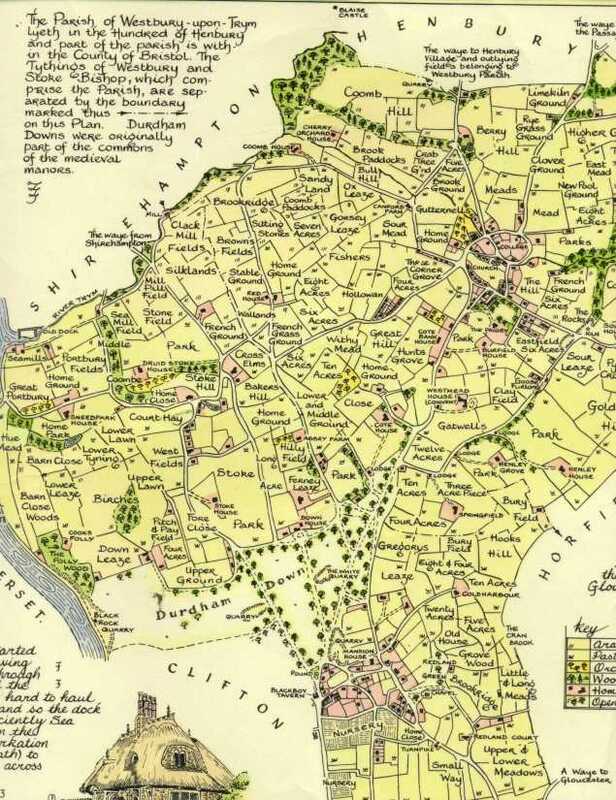 Part of an 1870s map of Bristol from Reece Winstone's Bristol as it was 1879-74 showing Cote Farm. Size of plot purchased by Austin Voke on 22nd March 1929. Note "Corporation Allotments" where the houses in Cote Park are today. Houses planned in Stoke Lane - Nos 212-176. The two drawn are 194 & 192, but were never built to that actual shape! Local legend says that Austin Voke built 212 for his own use. For some reason his wife didn't like the place & they lived in 192. Shows farm buildings which were Wyndham Rossiter's yard. The notice is for an Estate Agent and refers to "Cote Grange Estate". Note the concrete fence posts of 212 Stoke Lane - still partly visible in 2007! View to Stoke Lane from corner of Little Withey Mead. Circa 1935. The left hand house of the pair seen at the end of Little Withy Mead in Stoke Lane, number 186, sold new in 1931 for £1450, the same as 194 sold on 9th May 1930. 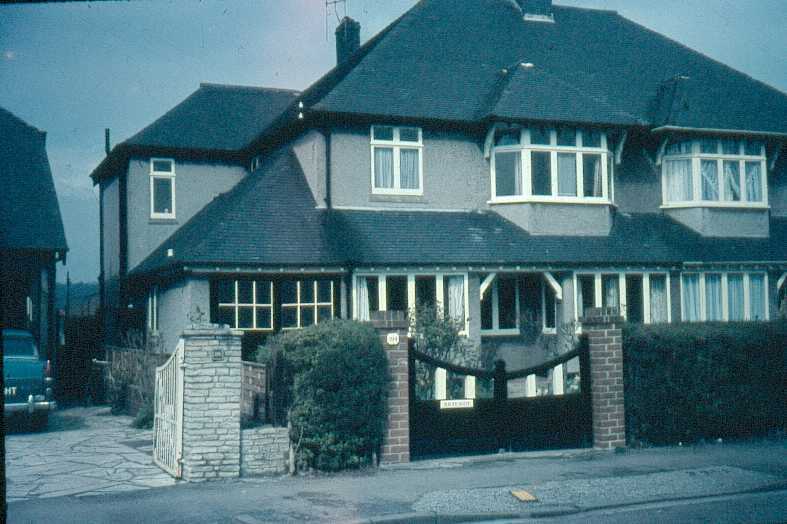 194 Stoke Lane in Spring 1966. Note original gate and garage doors. House name (Braeside) and number on gate & gatepost. NB Occupants of the houses in 1965, from Kelly’s Street Directory.